Find to your library’s catalog to search for items at your library and the other 98 SWAN libraries. Your library card works at all SWAN libraries (as long as your library is a member of SWAN). You can also place holds on items that are checked out or at another library, and they will be delivered to your library for you to pick up. Need help managing your holds, lists, and checkouts? Type any keywords into the search field to begin your search. 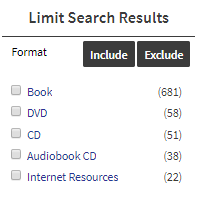 Find to your library’s catalog to be sure you are searching everything you have access to, including any available eBooks, streaming movies, and research databases. 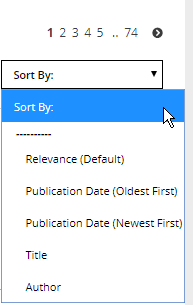 After you search, use the Sort By drop-down to sort results by publication date, title, or author. To get more information about an item, click on the title. Some items will also have recommendations. You can also copy the item’s permalink to send or save the page. Place holds to request items that are checked out, or to have items from other libraries delivered to your home library. Select the Place Hold button from the search results. 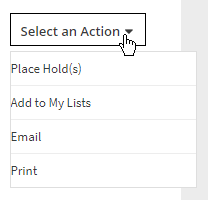 Or use the Select an Action drop-down list from the detail item description. Or if your library allows you to pick up anywhere, select the library you would like your item delivered to. You will see a confirmation, click Ok to continue searching. Select an eBook reader or format. The eBook will begin to download. When you find items while searching that you want to keep and organize, you can save them to My Lists. You can create and customize your lists, and you can print or email your lists. From My Lists, you can also place holds on items. If you are logged in, you will be asked what lists you want to save items to. If you are not already logged in, any items you add to will be sent to a Temporary List. Select My Lists in the top-right area of your screen. Log in, if you are not logged in already. Select Save Temporary List from the Select An Action drop down list. Enter the name and choose Save to save the list or Cancel to go back. Create more specific searches and get more specific results by choosing Advanced Search on the search bar. Include exact phrases or terms under Find items that have. Exclude terms under Don’t show items that have. Apply combinations of limits under Additional limits, including language, title, author, subject, and library. Note: While there are many options to limit your search, if you select too many, your search may not return any results at all. You can view your Digital Checkouts, Library Checkouts, and Checkout History in the Checkouts tab in My Account. Select My Account in the top-right area of your screen. Open the Checkouts tab, then open the Library Checkouts section. Select the item or items you want to renew or use the Select All option to select all your current checkouts. If you have holds available to pick up, you will see an alert. If you no longer wish to have an item on hold, you can cancel those items on hold. Select My Account, expand the Library Holds section. Check Select All or choose the individual item to cancel by checking the checkbox next to the item. If you see an exclamation mark to the left of the checkbox, that item is available and waiting for pick up. You can still cancel these and the library will return them to the shelf or to the next person waiting. Once the checkbox of the item(s) is selected, click the Cancel Hold(s) button. Confirm “Yes” to cancel the holds. Cancelled hold(s) will no longer appear in the list of items and a message will appear indicating that the hold was cancelled. If you have a valid email address in your library record, you will also receive a hold cancellation notice. You do not need to notify your library of this cancellation – they receive a report and move this item to the next person in line. Go to My Lists the top-right area of your screen to view your temporary and saved lists. Use the drag icon to drag and drop your lists in the order you want them to appear. Use the Arrange By drop-down list to arrange your lists alphabetically (ascending or descending), or by the time they were created (most recent first or oldest first). Visit your local SWAN library catalog.